We’ve all got blind spots, right? Things we've lived with our whole life that we never knew were issues until someone pointed them out? Well, I consider myself a pretty organized individual. Clutter drives me crazy. But, I’ve got 2 young boys and I feel like clutter follows me everywhere I go. My friend, Tara Bremer, is pretty much an expert at finding blind spots. Think your cabinets and shelves are organized? She came into my home and showed me a better way, a much more peaceful way. Her goal is to bring peace to your home. Let me tell you, she does just that. She first came over to do an evaluation. In just the 30 minutes she was at my house, she pretty much revolutionized my countertops. I had big containers of oil sitting out because I use them everyday. One simple change of moving the shelves up a notch and boom, all of the big containers fit! So simple, but so effective. Now I have so much more space near my stove and much less clutter. We put it on our calendar for her to return to reorganize more kitchen drawers and cabinets. I have those dreaded junk drawers. You know the ones that are a catch-all for anything that doesn’t have a home? The ones you hope no one mistakesyou’re your silver wear drawer. Yeah, that one. Here is one of 3 that I have in my kitchen. Tara took every item out of those drawers so she could see what she was working with. What do I normally do? I try to organize with everything still in the drawer, while taking a few things out at a time to make room. We could draw so many analogies from just reorganizing drawers. Seriously, how many times do I try to rid myself of junk in my life by rearranging instead of doing a full on evaluation of all of it, then only keeping what will bring peace? It’s funny for how what’s true for those junk drawers is true for our lives. Just get it all out there. Let the light shine on all of it and evaluate where everything should go. Chunk this. Keep this. Here is the result of some of her magic with my (no-longer) junk drawers, but fully functioning storage for items I use on a daily basis. Kids goggles? Put them in your pool bag. Those random candles and cupcake liners? They are all in their own little party box now that I retrieve only certain times of the year. Brilliant. It seems obvious, but we just get so caught up in our own messes it becomes our normal. That’s why it’s so great to get help with our blind spots. 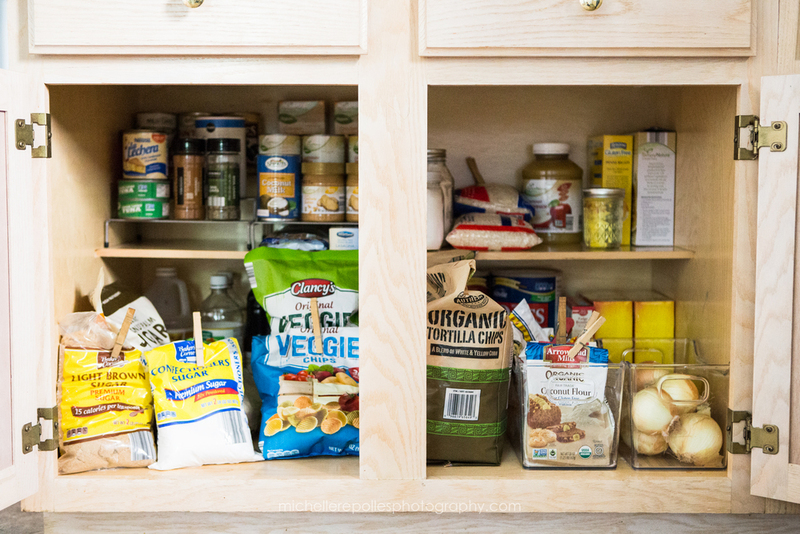 Let’s move on to my pantry, aka. bottom cabinets. They were a mess. I had so many bags of chips, specialty flours and sugars. Bags don’t stack, they just get jumbled all together. Tara to the rescue. Why not pour those flours into mason jars? That cup of oil that you’ve got in the huge bottle? Let’s put that in it’s own little jar. Genius. Why not put those onions in a plastic container? Again, take EVERYTHING out and evaluate what needs to stay, what needs to go. She even got out my vaccum! And, look how I can now see all the food items in my cabinets! She brought 3-Tier-Spice Organizers with her. Voila! We used them for canned goods. I am no longer shuffling to find what I need. I also know what I have. So, instead of buying another jar of peanut butter, I can see the 5 jars I have yet to open! As a lifestyle photographer, I loved the opportunity of capturing Tara in her element. Tara loves what she does. She doesn’t have an emotional attachment to those things you keep holding onto, so she can gracefully help you say goodbye and keep what really matters. Can you see how happy she is just removing labels from the Sterilite containers? (SO thankful she introduced me to these!) She thrives on bringing peace to your home by helping you find the blind spots you’ve never noticed, or areas you just don’t know how to make work in small spaces. It doesn’t matter how small or large the area, she can make it work. Her influence doesn’t stop when she leaves. I am benefitting from it everyday and my kids have even gotten in on organizing their own drawers. Win! Thank you, Tara Bremer (House Peace) for showing me my blind spots and bringing some much needed peace to my little home.